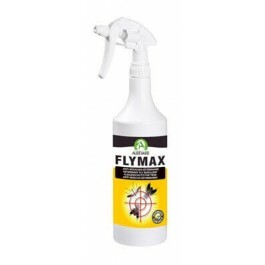 Flymax Nano Extract has been formulated by AUDEVARD Laboratories. It offers a refreshing fragrant protection around your horse against biting insects. During the summer period, you may experience factors that hinder your consultations or during horse-riding. The innovative formula blends extracts from plants within a composition developed in order to optimise adherence. Raw materials:Specific plant base, excipient qsp 100%. Liquid, ready to use. Maintain at room temperature and keep away from direct sunlight. Shake well before use. Use 30-40 sprays per application to thoroughly wet all surfaces. Repeat every 2 days, and after washing the horse. Reduce frequency to best suit your needs. One container holds approximately 13 applications. Adjust the size of the spray by turning the nozzle.